I decided that it was time that I actually put down my current GTD system, with all of the individual tools/applications that I’m currently using (on my MacBook Pro). This includes my daily, weekly and monthly routine. I labeled this with the current month because I am always tweaking my process and looking to test and apply better tools to help me be more productive. My primary tool for the collection process is a 12-month Daily 2007 Moleskine diary. I had used a general lined Moleskine notebook for the last year and wasn’t sure that the Diary would have enough room. What it has done is keep me focused in what I write – I don’t use it to keep my schedule, just my notes, thoughts and actions. Everything is then put into Actiontastic. I’ve posted about this application before, and I have really adopted it as my GTD application of choice. 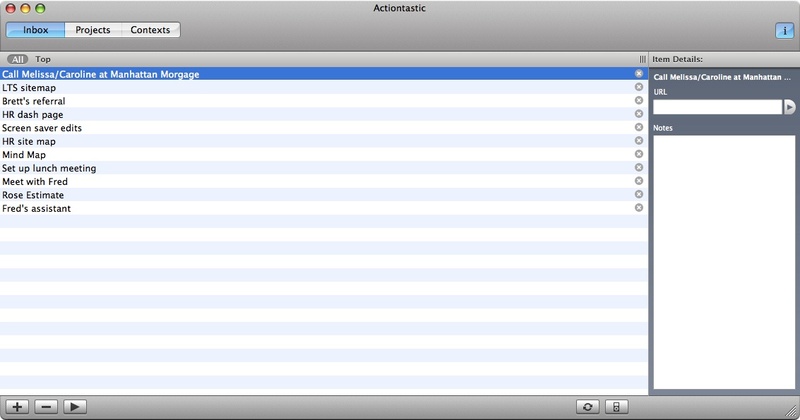 As soon as I get to work, I open Actiontastic and put everything into the Inbox function from my Moleskine. 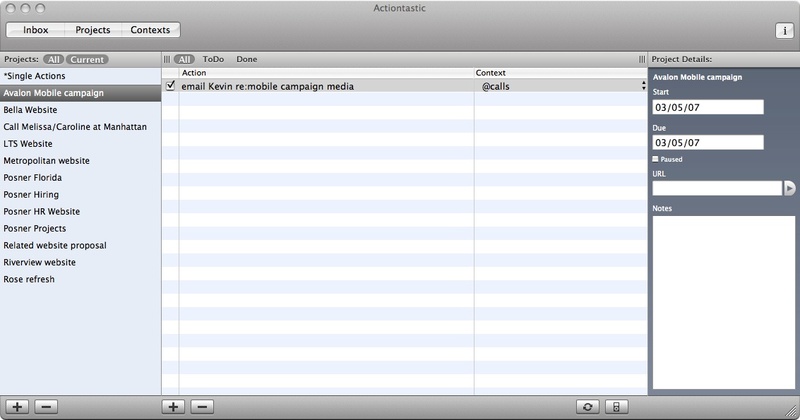 I use (mostly) Actiontastic’s integration with Quicksilver to get things into the Inbox. 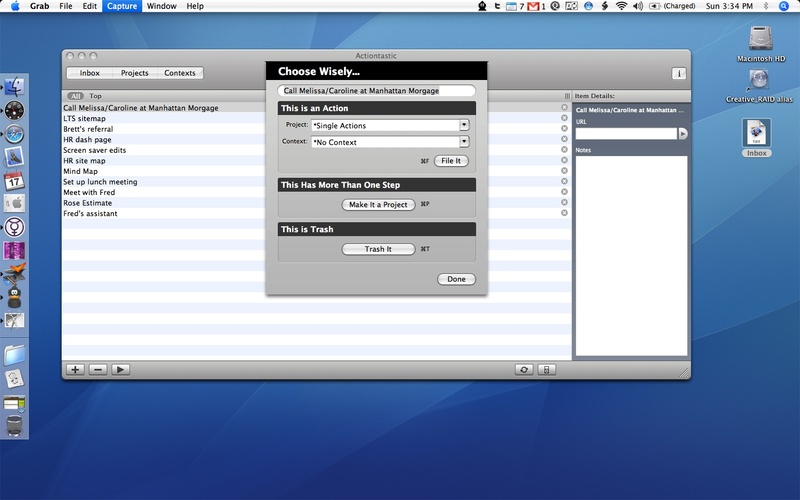 I’ll go into how I use Quicksilver (my favorite Mac app) in a separate post, but I use the Quicksilver=>Actiontastic Inbox throughout the day. I then open Mail.app and using Mail Act-On, MailTags and an Applescript (“toiCalInbox” set up to run as part of my Mail Act-On rules) included with the Actiontastic download. In Mail.app I also have folders set up for review (@Action, @Hold, @Respond, @Wait On, @Someday). Once I sort things into my folders, I run my “toiCalInbox” script which sends actionable email to iCal, then I hit the sync button on Actiontastic which brings it all into the Inbox. Sounds like a long process – in actuality only a few minutes. Once everything I need is in the Inbox – and while I do send things throughout the day, I only process first thing in the morning, after lunch and before I leave for the day (this is flexible as needed) – I hit the Process Inbox button (looks like a “Play” button). In Actiontastic I’ve set up my Projects and my Contexts (@calls, @emails, @errands, @mac, @meetings, @shopping, @waiting for, @web, @work) which also sync to iCal. Each item is processed to the appropriate Project and Context, which sets up the Next Actions and ToDos (as well as what’s Done). The new “Anti-Drawer” feature sets up the Start, Due dates (which also has a Paused flag), URL (messages, etc) and Notes. Once I’ve processed my Inbox (again – this happens in minutes! ), I hit the sync button so that everything is brought back to iCal (each context is a separate calendar). Which is great to then sync to my Blackberry 7100g (via Mark/Space’s new Missing Sync for Blackberry). I’m then free to actually work without having to really focusing on process. As each item gets done, I can tick it off and then during my Inbox processing times throughout the day everything continues to sync so that it’s all up to date. I’m adding the screenshots that I’ve posted before to illustrate the process. In my next post, I’ll focus on my weekly and monthly review process and the different applications that I use for those purposes. This is great. I’m going to try it out for a couple days and see how it goes. Sorry to bother, do you use the mailtags 2.0 beta or the 1.2? Thanks for your comments! I use the MailTags beta – Scott (the developer) has been extremely responsive and the beta is pretty stable. Let me know if you have any questions! Also, I’m posting a followup on my weekly and monthly review process and the tools I use for each – soon. Just today I found out about GTD. I am doing research and I found your blog. I gather you read the book? I think your system looks interesting. I’d like to try to set up something similar. Thanks for your time.